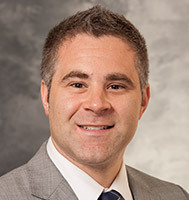 Dr. Richards is fellowship trained in urologic oncology, with a special interest in treating patients with bladder, prostate, kidney and testicular cancers. He specializes in open and robotic procedures. Dr. Richards' philosophy is to provide the best possible urological care for his patients. Dr. Richards conducts clinical, translational and health services research in urologic oncology. He has special interests in quality improvement projects aimed at streamlining health care delivery and efficiency for all patients with urologic malignancies.